Yes, they are flavourless and starchy and full of fat. If you are looking for something which is rich in fats and improves overall health, Chickpeas is the right food grain for you. One cup of cooked chickpeas (around a can) contains 269 calories, 45 grams of carbohydrate, 15 grams of protein, 13 grams of dietary fibre, 4 grams of fat and 0 grams of cholesterol. Additionally, chickpeas contain vitamin K, folate, phosphorus, zinc, copper, manganese, choline and selenium. Being an excellent vegan and gluten-free source of protein and fibre, chickpeas also contain exceptional levels of iron, vitamin B-6 and magnesium. Most non-animal sources of protein, including chickpeas, lack the essential amino acid methionine, while whole grains lack lysine. The combination of legumes with whole grains such as brown rice or whole-wheat bread or pasta produces a complete protein that contains all of the essential amino acids. 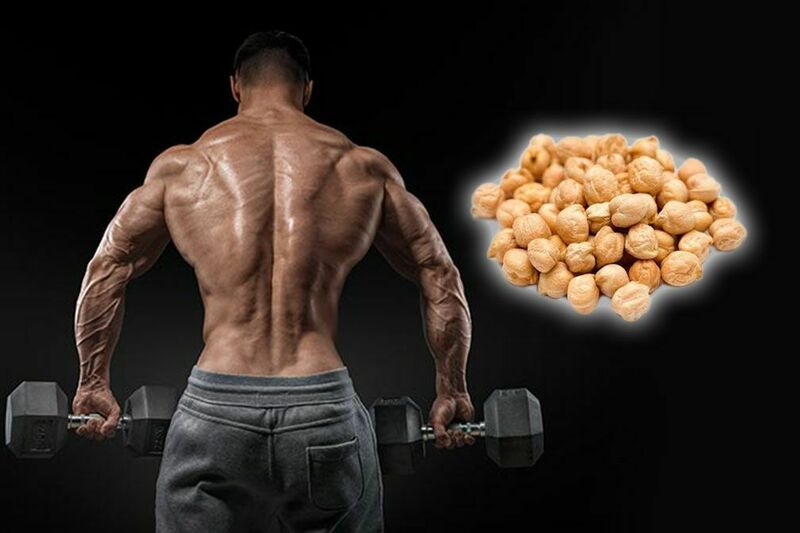 For vegetarians looking to build muscle, one of the key sources of protein they need to be looking into is chickpeas and other legumes. These will also be a good low-fat source of carbohydrates as well and make a great snack before a hard workout. Protein is an essential macro-nutrient that plays an important role in nearly every function in the body, from our vital organs, muscles, tissues and even hormone levels. Consuming enough healthy protein helps you to naturally slow ageing. Chickpeas are often eaten with grains or vegetables, for example in stews or in hummus that is eaten with pita bread; these foods luckily work together to make up a “complete protein”. This means they contain all of the building blocks of protein, called essential amino acids, that are necessary for the body to acquire from food in order to use for body function and energy. Chickpeas contain significant amounts of fibre, which helps lower the total amount of cholesterol in the blood, thereby decreasing the risk of heart disease. Cancer Selenium is a mineral that is not present in most fruits and vegetables but can be found in chickpeas. It plays a role in liver enzyme function and helps detoxify some cancer-causing compounds in the body. Additionally, selenium prevents inflammation and also decreases tumour growth rates. Chickpeas also help prevent the formation of cancer cells from mutations in the DNA. High-fiber intakes from fruits and vegetables like chickpeas are associated with a lowered risk of colorectal cancer. Vitamin C functions as a powerful antioxidant and helps protect cells against free radical damage. Chlorine is a very important and versatile nutrient in chickpeas that help with sleep, muscle movement, learning and memory. Chlorine also helps to maintain the structure of cellular membranes. It also aids in the transmission of nerve impulses, assists in the absorption of fat and reduces chronic inflammation. Mix these with a bit of turmeric and you’re in for a winner. Chickpeas are high in both protein and fibre, which helps to make you feel full and to curb food cravings and unhealthy snacking. Studies have shown that consuming fibre is correlated with having a lower body weight. These macronutrients work together to give us a feeling of being full after eating, while also helping to control our blood sugar levels and therefore maintaining our energy.